I'm sitting on my couch as I type this looking at a basket of laundry that needs to be folded and will be hopefully folded after I'm done typing this blog post. If I don't type this out now GOD only knows what my composition and spelling will be like as later in the day my brain says time to rest (ok who am I kidding my composition and spelling isn't that great to begin with :-)! I received a message the other day from one of my peertrainer friends and they were feeling bummed and discouraged on there weight loss journey (if you are reading this I hope you don't mind I'm posting this on my blog). "sonya - totally thought of you when i was pulling out of the pkg lot of the grocery store tonight...feeling frustrated...and wanting to quit b/c my workout took up my AM and I could have been doing laundry instead...and I thought sonya does this and she has 2 little kids and mine are bigger and it's easier for me...why am I whining??" 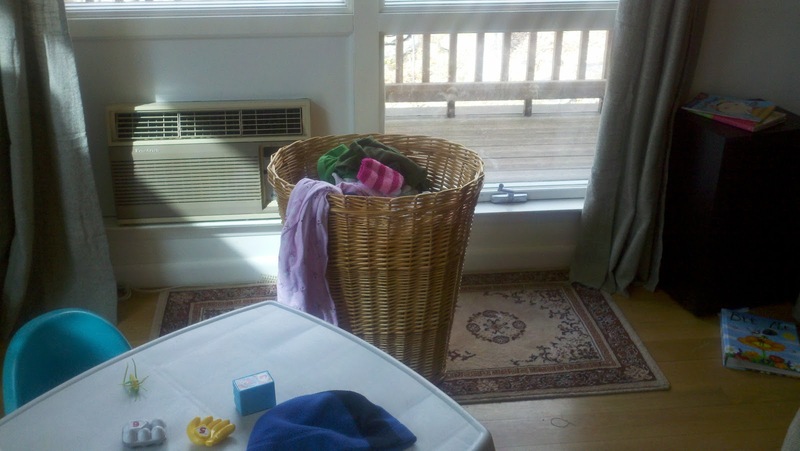 This is a picture taken in my living room and the basket in the picture is full of clean clothes that need to be folded and put away. The basket has been sitting there for about three days? I asked my husband to bring it into the living room so I could fold it and it has been everyone just picking for a sock or a shirt. My goal is to get this basket folded before I go to bed tonight (there's another basket of clean laundry waiting for me). Not sure if you can tell by the picture but the window has little finger prints all over it, the floor could probably use a quick vacuuming, the baseboards need a deep cleaning with a sponge, the floors could use a washing, the curtains need to be hemmed, and the book on the floor along with the toys need to be put in there proper place. What did I do today? - I made breakfast for my boys and myself. Packed a lunch for my son for school. Packed a lunch for my 2yr old to eat at the day care gym ( I had a yoga class and I needed to run three miles). Took a shower (that included shaving my legs), flossed and brushed my teeth, got myself dressed and my two year old dressed (cleaned up a spill or two by the two year old). Went to gym for two hours then came home and gave my son a snack while I had a late lunch. Read my son a book and put him down for a nap. Changed out of my gym clothes. Checked email, logged my food, and worked on updating my phones calender as there are four birthdays in the next two weeks (one of which is my husbands). - I so need the reminders on my phone or I feel even more disorganized. Got my son off the bus. While my two year old was sleeping (husband has a home office) I took my older son to the local library to return an over due video and to pick up a running book (Jeff Galloway) for myself. Came home and worked with my son on unpacking his lunchbox then had him eat a snack. I then started working on supper by peeling and slicing carrots until my little one woke up. Then I finished preparing supper while the little one cried because he wanted me to hold him and I got to listen to my older son cry because I wouldn't let him have gum so close to supper time. Cooked fish on the grill and cleaned off dining room table. Had supper, husband got the kids washed and jammied. My older son thought it would be funny to pea on one of the dog beds (I have no idea why). That in turn created the need to wash the cover of the very large dog bed. Vacuumed the stairs and hallway. Kids are in bed and I'm going to finish cleaning up the dining room table and then fold laundry after this blog post. I have a feeling that most moms are in the same boat. Struggling to maintain a part of self for themselves while trying to get all of the things done in a day. Everyone's situation and circumstances are different and the grass isn't always greener. Different maybe but not greener. Tomorrow morning there will be clean dishes in the dishwasher that will need to get put away along with dirty dishes that need to get loaded and I will need to go to the grocery store tomorrow. But I will do my running first as if I don't it will never happen. The dishes will always be there and so will the laundry but my body can't wait nor can my health or well being. What effects me effects everyone in my family and vice versa. My house is crazy right now especially with my two year old running about who gets into everything (I must say I think I get more of a workout just bringing him grocery shopping vs. going to the gym). In short I put myself at the top of the list because no one else will. As they say on the airplane: put on your own oxygen mask first. Hoping you can find some time and space for yourself. No matter what! Yes, I am in the same boat. The laundry, the dishes, the cooking, well, it never stops. Some of the stuff I actually enjoy, like cooking (and eating good food), some of it I enjoy a little less (like vacuuming, especially when Stella starts crying and I have to pick her up and vacuum while holding her in my arms). The bottom line is that the house is never as clean as I would like it to be, but that's okay. I just need to lower my expectations and not stress over it. I once read a book on "radical homemakers" where a woman wrote that her house was a little messy - it did not look like one of those model homes that you see in magazines - but it did look like a house which was LIVED IN. I really like that. This is the house we live in, and this is what it looks like - toys on the floor, laundry which needs to be put away. If I wanted a spotless house the only way I could get it and keep it that way is if we did not live in it. love this post. thanks for sharing. i think any mom can relate to the laundry, base boards that need a scrub,etc. I'm with you-if I don't get the exercise in first thing, a million other things will find their way into my day. I hope you had a good run this morning! I am aiming to get in a nice long run tomorrow as Nathan is home as of tonight =yay! I love the Galloway book; curious to get your thoughts on it the next time I see you. your priorities are in order, Sonya. my kids are grown, but when they were growing up i was in the same boat. it wasn't always exercise that i was doing (although for years i did walk late at night after they were safe in bed). i had a professional job that required more than 40 hours a week, for awhile i had a job that required me to travel for a week at a time, i did things with my friends, i liked to read. and i wanted to spend time with my kids when i could. at any rate, housework was never high on my list. my grown kids tell stories about my bad housekeeping even now, but they do so laughingly. and the bad housekeeping didn't destroy their health, physically or mentally. i'm still not a good housekeeper and i could care less!! there are so many more important and fun things to attend to. by the way, i'm ordering the galloway run/walk timer rather than getting the watch, after some thought and looking at the watch again today. also, today i got new running shoes and some exercise pants that fit me (others were way baggy). YAY!